POLITICS PODCAST: Can the ANC afford the Ace and Jessie debacles? ANC secretary general Ace Magashule is still in the headlines following the release of the book Gangster State: Unravelling Ace Magashule's Web of Capture by investigative journalist Pieter-Louis Mayburgh. A group of protesters, some clad in ANC T-shirts, disrupted the book's Gauteng launch in Sandton on Tuesday and the V&A Waterfront cancelled hosting the Cape Town leg. But the launch still went ahead at a different venue and the ANC and Magashule distanced themselves from the disruption. News24 senior political reporter Tshidi Madia and News24 associate editor for in-depth news Pieter du Toit discuss how Magashule cannot be divorced from the ANC and how this is simply politics of deflection. 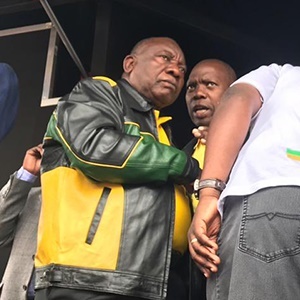 The protests in Alexandra took the lion's share of airplay, with President Cyril Ramaphosa and EFF leader Julius Malema both suggesting that Johannesburg Mayor Herman Mashaba should have visited the township following the #TotalShutDown protests. "I will not make public grand plans about what is to be done in Alexandra without the necessary budget to follow as this would fall into the category of ANC cheap politicking," Mashaba wrote in a column published on News24 this week. Is what's happening in Alexandra a genuine and organic protest? Or is the ANC the third force?